This past September, Gi-Wook Shin, a professor of sociology, published a book titled “Superficial Korea” that discusses social issues in South Korea and suggests cultural and political solutions to them. Shin sat down with The Daily to reveal his writing process and the important takeaways of his book. The Stanford Daily (TSD): How long have you been at Stanford and what led you to become a member of the Shorenstein Asia-Pacific Research Center? Gi-Wook Shin (GWS): I came here in 2001 from UCLA. At the time, I was a professor and senior fellow at the Freeman Spogli Institute. One reason I moved here was to establish the Korean Studies program. Then I became the director of the Asia-Pacific Center in 2005. Since then, I’ve remained the director. TSD: What sparked the idea for the book? GWS: Do you know about the Sewol ferry sinking? In April of 2014, I was contacted by a publisher in Korea, because at the time, many Koreans and foreigners thought that Korea was an advanced country. But when they saw what happened [during the Sewol ferry disaster], they began to wonder if Korea is truly an advanced or third-world country. The Korean public was upset and disappointed at the government’s handling of the situation, many becoming psychologically ill after the incident. The publisher was curious as to how a foreigner viewed Korea. TSD: Could you give a brief overview of the book? GWS: The topics are fairly heavy, but it isn’t an academic book because it’s written for the wider audience in Korea. The first part is about my observations of Korean society. I was trained as a sociologist, doing a lot of work on policy, foreign affairs and security in Korea and East Asia. Obviously, I used my professional knowledge and experience, but I essentially provided my personal views. The second part is about what and how Korea can learn from Silicon Valley. Part three is about foreign relations, including what the United States means for Koreans, U.S.-China relations and North Korean issues. TSD: Why is Korea labeled as “superficial” in your book? GWS: The purpose of networking in the American context is to broaden your relationships. In Korea, it’s actually to narrow them and become more cliquey. For example, the purpose of questions, such as “How old are you?,” “Are you married?” or “Where did you go to school?” is to find commonalities with others and make your own cliques. At that moment, you determine “Am I going to be your friend?” [and] “Are you below me or above me?” There’s more bonding within your own groups, making them stronger, but in reality, there’s greater discrimination. In terms of education, the students have a list of achievements, which are called “specs” in Korea. Their resume may have tons of specs, but most are very superficially done because they can’t possibly do all those activities with serious commitment. The education system produces very standardized products; there’s pressure to be similar to each other. TSD: As you saw and critiqued these social maladies, were you personally affected? GWS: Not so much. I left Korea in 1983 just after college, so I’ve lived in the States longer. Of course, I travel to Korea very often, staying in touch with family, friends and colleagues, but I can more objectively compare my life here with that in Korea. When I stay in Korea, I asked myself, “If I came back to Korea, can I survive?” People say it’s always fun to visit Korea, but it’s hard to live there. Additionally, the expectations are different. I’m viewed as a foreigner from the outside, despite my Korean ethnicity. That’s why my perspective can be somewhat unique. Because I’m not a “Korean Korean” living in Korea, but I’m also not a complete foreigner without any background. 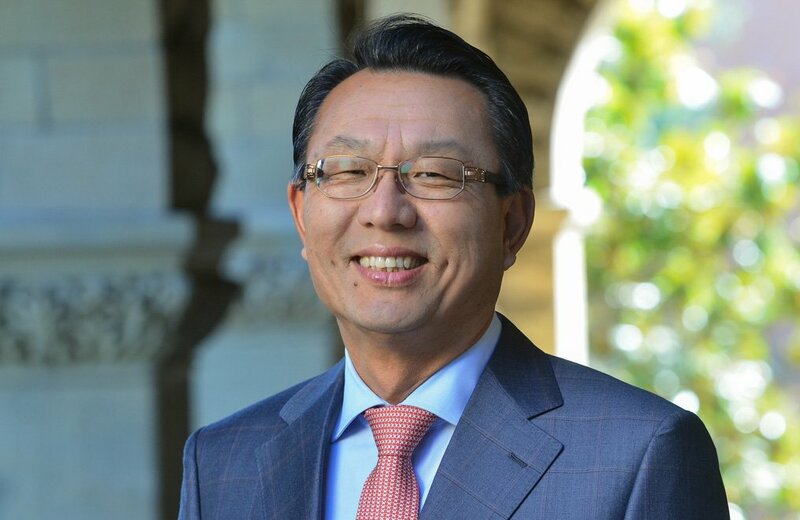 TSD: Given the current political atmosphere on the Korean peninsula, will there be changes to Stanford’s Korean Studies program? GWS: Naturally, our program has received more attention due to North Korean issues. As an ethnic Korean, it’s quite sad to see tension on the Korean peninsula. But as an expert of Korean affairs, it’s good to have some problems. Otherwise, no one will care about Korea. Changes won’t necessarily happen. We’ll continue the policy work, trying to enhance mutual understanding between American and Korean policymakers. One goal is to engage the younger generation, including Stanford undergraduates, encouraging them to suggest ideas on Korea and Asia. TSD: What solutions do you lay out in the book? GWS: For social life, I think Koreans should take more time to reflect on their lives. It’s very high-tempo as people spend lots of time working and maintaining social networks. But I wonder if those relationships are sincere and genuine or if they’re superficial. Second, I think Korea needs to be more open and value cultural diversity. While the atmosphere has changed quite a bit, it’s still a very closed society, unfriendly to outsiders. Korea attempts to emulate Silicon Valley but can’t seem to attract global talent, because it’s not an easy place for foreigners to work and live. Regarding foreign affairs and security, I mention dolphin diplomacy in the book. Korea is a like a shrimp among whales — a common phrase when you describe modern Korea. Among the “whales” like China, Russia and the United States, Korea is a very small country. However, in terms of economy, military and power, Korea has grown; it’s now among the world’s top 15. Korea should become more confident in [its] own power and in dealing with larger countries. TSD: Have you received any feedback from readers in either Korea or America? GWS: It’s only been about a month, but I think it’s well read. Sometimes readers do take offense and doubt my suggested solutions, because they perceive me as someone who doesn’t understand Korea sufficiently. That’s understandable. Most readers agree with what I’m saying. However, even though you may agree, psychologically, you may feel uncomfortable psychologically, given that this is a critique on one’s mother country. I’ve tried to remain polite, and honestly, I could’ve been more aggressive.